Westbourne Motors promise a speedy, efficient and reliable service to keep you, the customer happy. We use the latest diagnostic equipment. We repair over 85% of cars at roadside. Up to date database enabling technicians to access 98% of all vehicle lock outs. Speedy response to all roadside breakdowns reducing waiting times for you. Strategic service centres across Southern England are at hand to diagnose and repair a while-you-wait-service for all major faults which cannot be repaired at roadside. Repair packages are available at one of our local service centres where we can quickly examine, diagnose and quote for any repair and at a price you can afford. 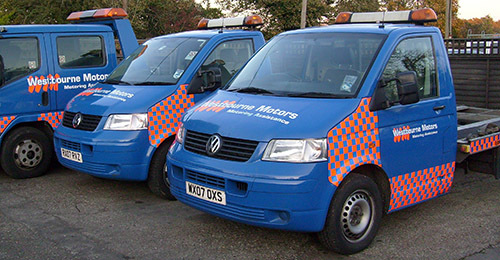 Courtesy cars are available allowing customers to continue their journey whilst we undertake the repair. Courtesy cars are subject to availability. This service extends to motorcycles, cars, vans and commercial vehicles, please call for a quotation.